L: 80" x W: 76" x H: 14"
$2,509.00 Select mattress and base options to see price. Sealy Posturepedic Hybrid Silver Chill Hybrid Plush King Mattress Both comfortable and supportive, the Sealy Posturepedic Hybrid Silver Chill plush king mattress offers an amazing night's sleep. SealyImmersion™ Advanced Memory Foam will have you feeling like you're floating as you rest, plus it allows for a more comfortable, breathable sleeping experience. Both comfortable and supportive, the Sealy Posturepedic Hybrid Silver Chill plush king mattress offers an amazing night's sleep. SealyImmersion™ Advanced Memory Foam will have you feeling like you're floating as you rest, plus it allows for a more comfortable, breathable sleeping experience. 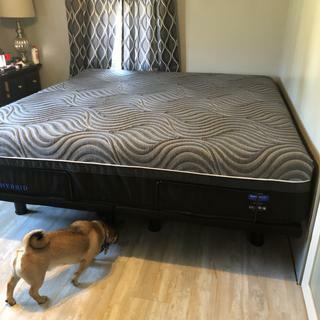 L: 80" x W: 76" x H: 19"
L: 80" x W: 76" x H: 23"
We recently purchased this mattress set with the Sealy box spring and our sleep comfort could not be better! The mattress is supportive, but extremely comfortable without any noted pressure points or excess firmness. It sleeps much "cooler" than our previous latex foam mattress and we truly awake more comfortable and rested than ever before. Highly recommended product! Extremely comfortable! Completely satisfied with our purchase. I slept soundly on this mattress. My husband tosses and turn all night long and I can barely tell he’s in the same bed! I love it. Was already comfortable on the first day, looking forward to when it is going to be fully broken in like the one in the store. Very happy with all of our purchases that day and delivery was great as well! Best mattress we have ever had. Love the adjustable base with zero G. Worth every penny! I have never slept better. Great product! Lou was very patient and helpful and really took his time to help. Absolutely love our Sealy posture-pedic hybrid king mattress! My husband and I have been shopping around for a mattress for a long time. We spoke with TJ at the Quakertown office and he was so helpful in getting us the bed we loved! We cannot be happier with our purchase and the fantastic service TJ provided us. Great mattress! Not too firm and has solved my shoulder problems caused by a bad mattress. lots of room too. Love it.